If there was such a thing as a ‘people’s cigar’, it would be called Handelsgold. The fact that over 15 billion of these cigars have been sold since the product was launched in the mid-20th century is a testament of the brand's popularity. The “Handelsgold” brand name had in fact been trademark protected for André since 1935 but due to the Second World War the brand was first born in 1946. That year, Walter André – the creative force of the family company which is steeped in tradition – commissioned a printing company based in East Westphalia to design new packaging for the cigar. When working on the graphic design, existing, interesting drafts were discovered (the two famous globes), which bore the name Handelsgold. An agreement was quickly reached that with this design the ideal “package” of the brand name and packaging design had been found and it was purchased without further ado. 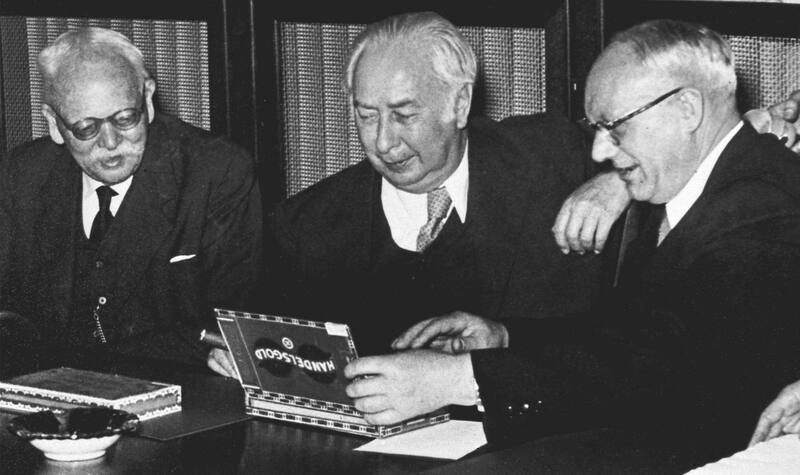 At this time, a decision was made to sell all cigars produced by Arnold André under the brand Handelsgold from now on which, over the next decades, developed into a unique success story. Once the Second World War was over, people in Germany began to rebuild their country, making great endeavours under circumstances involving much hardship. With the onset of the (West German) economic boom years, the growth of the Handelsgold brand also started – growth which seems to never want to end. At that time, saving was of high priority for people. People thought twice before spending a single ‘Pfennig’ and then often decided in favour of saving rather than spending. The credit balance in saving books grew – slowly but surely. And it was exactly against this background that the pricing of Handelsgold was structured. True to the original idea of “quality for everyone, at prices everyone can afford”, even the product name made it clear exactly what the individual cigars cost. Handelsgold No. 10, 10 Pfennig. Handelsgold No. 15, 15 Pfennig. And even the legendary 100K, the king size, only cost 10 Pfennig. This form of product labelling was so easy to remember and successful that Arnold André’s brand strategists had no reason to introduce any changes for more than 20 years. The inventor of the social market economy and father of the German ‘economic miracle’ is as well known today as the economic miracle itself. 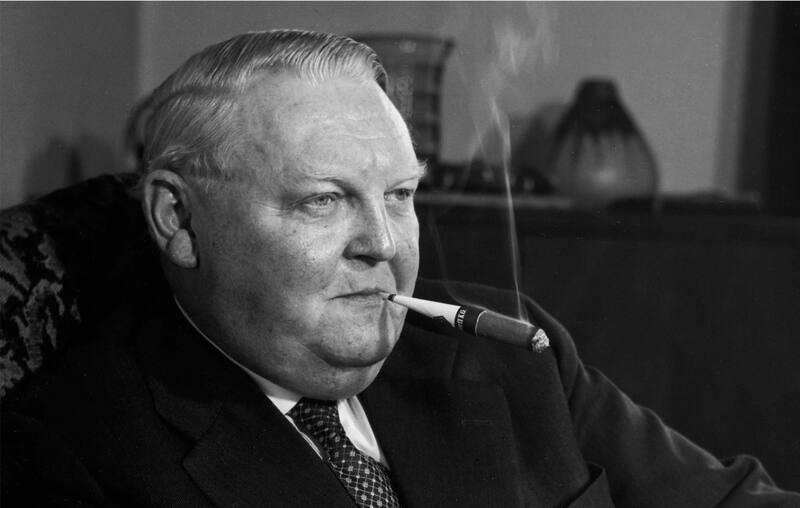 According to Mark Twain: “Eating and sleeping are the only activities that should be allowed to interrupt a man’s enjoyment of his cigar”, an opinion obviously shared by German Minister of Economic Affairs Ludwig Erhard who was virtually never to be seen without a cigar. When choosing his cigars this popular politician rarely made compromises and – in keeping with his profession – paid attention to getting good value for money – he smoked Handelsgold. This was surely also a sign that he was very aware of how progressive the Arnold André company was in how it operated with its products on the market. An article once summarised the success story of Handelsgold: “Handelsgold is a name which completely encompasses all the characteristic features of a modern brand: Clear pricing by means of far-sighted calculations, exceptional quality for a fair price by means of price maintenance, and efficient production of large and standardised batches, smooth sales operations via its own close network of factory warehouses and also preparation of the market by means of brand advertising”. 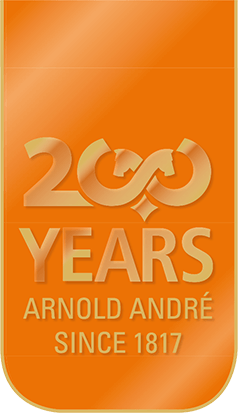 In terms of marketing the André company was consequently well-established at a professional level and able, for example, to support the Handelsgold brand with effective advertising over the years. In the 1950s, sales promotions still dominated. A popular image in Germany was of saleswomen with their ‘hawker trays’, selling on the “AVUS” road – part of the legendary motor racing track in Berlin. At that time – in addition to the exhilarating sight of smoking tyres – enthralled spectators would also stand at the racing track smoking a Handelsgold. In 1954, young and old would swarm around in front of pubs as this was where the first TV sets could be found. Some would have also had the chance to witness the ‘miracle of Bern’ at the 1954 FIFA World Cup Final on the TV – in theory. In reality, the rows of hopeful spectators stood in ten-fold rows on the pavements trying to get a glimpse of the action. Only the cheering and rejoicing indicated that, in neighbouring Switzerland, Germany had become football world champion for the first time. By the early 1960s, a “home cinema” had become a regular feature in the living room in most homes, as had the absolutely unbreakable kidney-shaped coffee table in Germany. And whenever Germans were sat in front of their television sets, they of course also saw the first elaborately produced Handelsgold adverts, featuring the slogan “Die ganze Welt des Tabaks” (the entire world of tobacco). 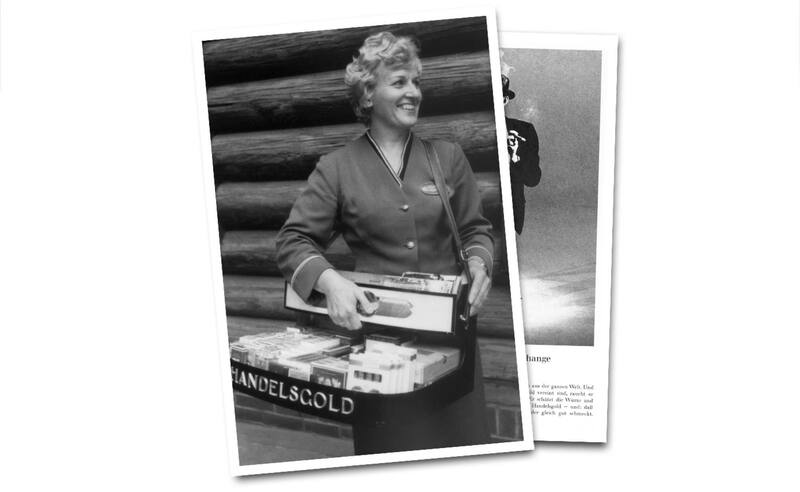 Handelsgold cigars were also advertised on radio, in magazines, at the cinema and in daily newspapers. 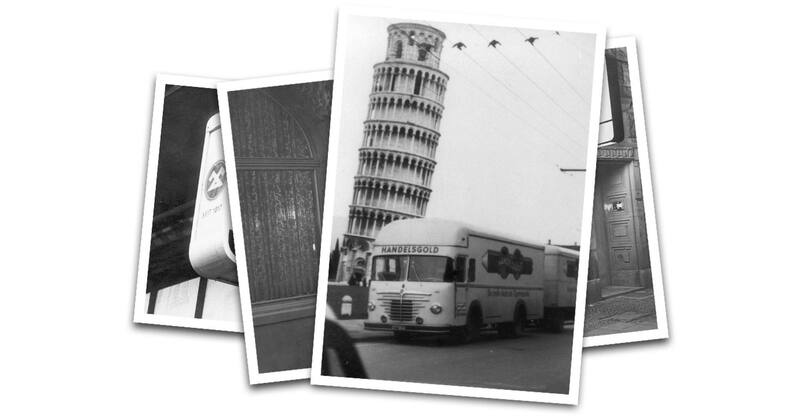 They were also featured on the sides of trucks and delivery vehicles as mobile advertising. All of these and many more activities relating to Handelsgold cigars meant that smokers developed an unwavering trust in “their” brand, and it continues to be effective up to modern day. Anyone who finds themselves out in the big, wide world today can expect to find the distinctive branding of Handelsgold in many countries. Whether in parts of Europe, America, China or Africa – wherever the journey may lead, Handelsgold is already there. It is a genuine export hit and a successful idea which, from the very beginning, has been exactly to people's tastes and given them just what they are looking for. To date, Handelsgold cigars have been sold more than 15 billion times in over 80 countries around the world.